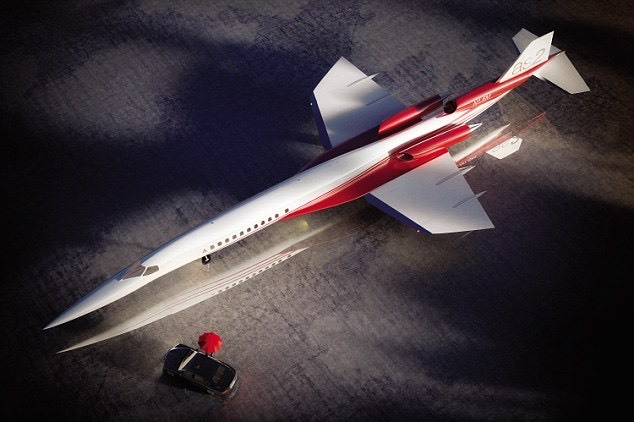 The Aerion SBJ is a concept for a supersonic business jet, designed by Aerion Corporation. If produced, it would allow practical non-stop travel from Europe to North America and back within one business day. The target price is $80 million (in 2007 dollars), with development costs ranging from $1.2 to $1.4 billion. Entry into service is expected to be 2014. It has a planform which is similar in wing and tail shape and arrangement to the F-104 Starfighter. Thanks to its design, the Aerion Supersonic Business Jet will be able to cruise at 1.15 Mach over land without producing any boom on the ground. The plane can also keep a 0.98 Mach speed offering a similar cost-per-mile than competing subsonic private jets and complying with US regulations. Over water, however, you will be free to speed it up and sustain 1.5 Mach with ease. To give you an idea, at this speed the Aerion can cross the Atlantic in two hours (it has a 4,600 miles range over 45,400 pounds of fuel) thanks to its Pratt & Whitney JT8D-219 engines. The Reno, Nevada based manufacturer that was established in 2002, based their business plan on the research that foresaw the sales of around 8300 business jets between 2004 and 2014. Their idea is to get at least part of this potential market of around 131 billion USD, with a break-through, light, special, supersonic jet. The team of Aerion includes former top management figures of LearJet and Bombardier for example, which shows that the program is taken seriously and is not just some sci-fi style research. 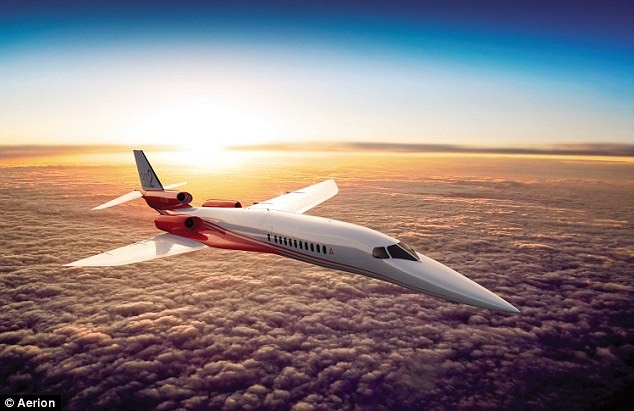 The project that will include construction of 5 SBJ (Supersonic Business Jet) prototypes (2 to be used for tests on the ground, 3 in the air) has been financed by a Texas Billionaire who deeply believes in the success of this project. Even though some larger aircraft manufacturers turned their backs on the offer for a partnership for now, he has continued to finance the progress that included a few successful, high altitude, high speed tests with smaller models of the plane with the radical new design for the wings. The tests included flights at 2.5 Mach, even though the planned supersonic cruising speed of the SBJ would be 1.6 Mach. As traveling at supersonic speed is not allowed at most parts of the world (except for above the oceans, and a few areas above Siberia, Canada and some parts of Australia), the aircraft will have to travel between 0.99 - 1.1 Mach above the mainland and can only increase its speed to 1.5 Mach once it reaches the Ocean. According to the manufacturer, the new wing design allows for a boomless cruise of 1.1 Mach. The radical new design of the wings also brings much lower noise emmissions, and according to the manufacturer, the plane will deliver within the most strict noise limitations. The engines are to be provided by Pratt & Whitney based on an existing engine specification. In reality the new plane would be able to fly as far as 7400 km’s, thus the New York - Paris flight would be reduced to 4.25 hours, and New York - Tokyo for example would be 9.5 including a one hour refueling stop in Anchorage, but even the flight between New York and Miami could be reduced by almost one hour. A possible route between Chicago and London would be flown at 5 hour 42 mins, including the 2 hour Atlantic crossing at high altitude (flight level 510) and at supersonic speed. The guests on board can have lunch, take a nap, send/receive emails, or talk on the phone - just like in any business jet currently existing. The cabin would feature a restroom, a kitchen and could carry a lie-flat bed or a four seat sofa or even a shower if required. It can seat a maximum of 12 people, with an internal cabin height of 1.88 m. The designer claims that the operating costs will be comparable to today’s larger business jets, thus they will not be supersonic, regardless of the possible speed. Possible routes, ranges and times can be found on the manufacturer’s site. As the latest chapter in the story of Aerion SJB, at last year’s Dubai Air Show , ExecuJet Aviation (based in Switzerland) received unique sales rights for the the world outside of the US, and just days later the first potential customer, Sheik Rashid Bin Humaid Al Noaimi has signed a letter of intent and even provided a USD 250.000 deposit for the first of the USD 80 million private jet, which is now planned to be delivered in 2014. The cost of the AS2 is thought to be more than $100million - over £60million - and Aerion hopes test flights will begin by 2019.